Can you imagine going down the Colorado river in the grand canyon in a raft like the one in this picture? The view is beyond belief. Although they say a picture is worth a thousand words, even this picture does not do justice to the scenery. 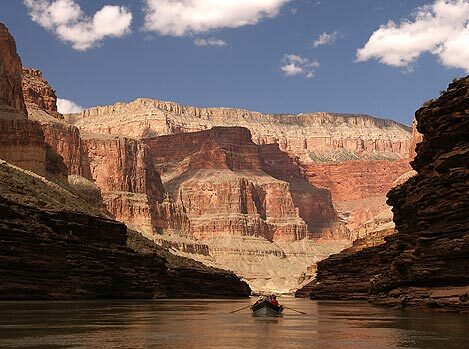 You will see fantastic scenery in the Grand Canyon from the vantage point of the Colorado river on a raft. We recently spoke to a person who used to guide trips that would last up to two weeks through the Grand Canyon. He never got used to the beauty and the grand views that a trip like this would provide. He enjoyed his time as a guide very much and goes back every year to take in this great view. Grand canyon rafting with a properly outfitted team can be exhilarating. Something that you and your friends will talk about for many years. The scenery is one thing, the exhilarating rides through the rapids is another and the evening camp life under the stars is another. With no lights to blind your eyes, you will be able to see millions of stars on a clear night. They will equally enthrall you as much as the river does during the day. One word of caution is warranted if you are planning in taking one of these trips. The water is very cold and comes from snow melt a long ways up in the mountains. Ice cold water such as what is in the Colorado River is also very fast moving and people have succumbed to hypothermia very quickly. They have been swept away before anyone could do anything about it. When you guide tells you to stay out of the water, he is not doing this to be mean. He is probably saving your life. Follow his advice, because if you do not one of two things will happened. If he is a strong guide, he is going to call in a helicopter and have you removed at your expense. Although you will be very upset and probably threaten lawsuits etc, he will have most likely saved your life. If he is a weak guide, he will tell you what can happen, but then you will go and do it anyway. You probably will end up dead in the cold Colorado river water. Grand canyon rafting can be a lot of fun, just follow your guides rules and recommendations to remain safe. This is really a trip of a lifetime and why would you want to ruin it by not following the guidelines of your guide. He or she has been doing it for years, knows what works and what does not and also what is safe and what is not. Follow his instructions and I am sure you will have a really great trip.